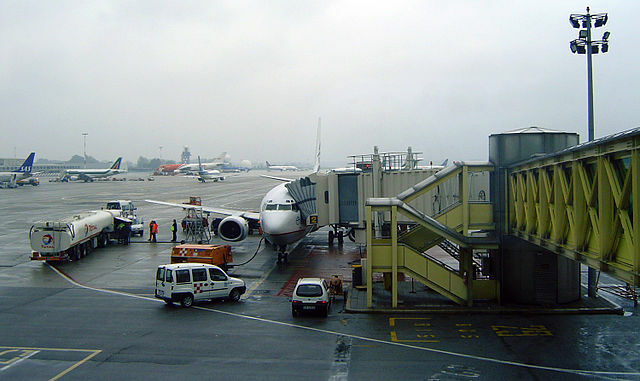 The Linate Airport is one of the three major airports of Milan, along with Malpensa Airport and Bergamo. Due to its greater proximity to Milan (7.8 km), south-east of the city, compared with Malpensa, it is mainly used for international, domestic and short-haul flights with a total of 9,229,890 passengers in 2012. Its name comes from the small village where it is located in the town of Peschiera Borromeo while the official name is Enrico Forlanini Airport, in honour of the Italian inventor and aeronautical pioneer, born in Milan. Linate airport buildings are located in the municipality of Segrate and the complex is mostly situated in the town of Peschiera Borromeo. The Linate Airport was built in 1930, near Milan Idroscalo, when that of Taliedo started to have an insufficient size to cover the commercial traffic. So Linate has undergone a complete reconstruction, first in 1950 and later, in 1980. Considered a "city airport" for its proximity to Milan, the Linate Airport offers numerous and interesting services to all travellers at the airport. It consists of a terminal and has two runways, respectively used for commercial traffic and aviation. You can contact the phone number +39 02 232 323 to request and receive the necessary information. You can dial this number every day in a wide time range between 5:30 am and 1 am. For more information, you can view the official website www.milanolinate.eu. The Linate Airport is connected to the main town and other towns in Lombardy by streets and bus. It is, in fact, reachable from the highway through viale Forlanini or bus lines 73 and X73 (managed by ATM). An interesting new feature supposedly coming in 2015 is the metro line 4 for a direct connection. Another easy way to get to the airport or other destinations from the airport is the car hire Milan Linate. In this way you can move around without difficulty, where you want in complete and total freedom and independence. The convenience of having an available vehicle is that of being able to manage it as you prefer. Especially if the final destination is not Milan, getting to the hinterland or to the other towns in the region will be easier if you decide to rent a car directly from the Linate airport.